The EU Referendum and the years since have exposed a new politics in Britain. There is a division between those who are attached to the idea of a globalised world and those who believe that politics is fundamentally local. The values that appeal to the globalising Internationalists are no borders, free movement and human rights. The values that appeal to people locally are local employment, local education and health services, sustainable wages and a sustainable local environment through controlled borders and law and order. The Internationalists back Multinational Corporations and a mobile workforce, the local people back local industry and local employment. Internationalists desire a powerful presence on the world stage, local people want to keep a low profile that is secure. The historical division of humanity into various independent states has led to a multiplicity of cultures, languages and ethnicities. Those who prefer local politics want to continue this diversity whereas the Internationalists prefer slow assimilation through multiculturalism leading to a single culture and ethnicity globally. The Internationalists are run by groups like the European Movement and its Bilderberg Group. Many of their members and fellow travellers have joined the UK Labour Party in the hope of eventually taking it over. The local people in the UK are members of Labour, Conservative and UKIP parties. The Conservative Party were one of the founders of the European Movement and the Bilderberg Group had seen the Tories as its power base in the UK. Ken Clarke, Amber Rudd, George Osborne, Greg Clark are all Bilderberg People. Unfortunately for the European Movement the Tories also contained those who most favoured localism. The rise of China, and to some extent Russia, India and Islam, means that in the twenty first century European Internationalism is likely to stop at the EU. The Internationalists in Europe are rapidly becoming EU Nationalists. They desire a single economy, a single set of laws and a single culture for the EU. The UK has a first past the post two party system and it is only by capturing an existing party that our views can be represented in Parliament. 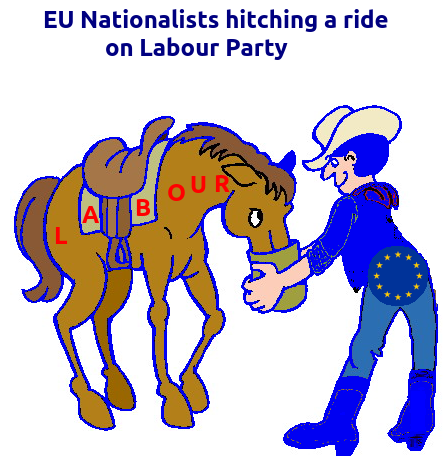 The Labour Party has been captured and is now the party of EU Nationalism. It is time for all those who believe in local politics to move from Labour and UKIP into the Conservative Party so that they can present a united front against this new enemy of Britain. In the same way as those who desire the termination of an independent UK have joined Labour and are bending it to their will, those who desire the continuation of an Independent UK should join the Conservatives. Previous Today in Brexitland – what now?